Castlevania Season 2 is finally available for fans to stream right now on Netflix! The Netflix Release Date is October 26, 2018. Watch Trailer and get all the spoilers, reviews and technical stuff about Castlevania Season 2 here. Inspired by the classic video game series, Castlevania is a dark medieval fantasy following the last surviving member of the disgraced Belmont clan, trying to save Eastern Europe from extinction at the hand of Vlad Dracula Tepes himself. The animated series is from Frederator Studios, a Wow! Unlimited Media company, written by best-selling author and comic book icon Warren Ellis and executive produced by Warren Ellis, Kevin Kolde, Fred Seibert and Adi Shankar. Season 2: As Dracula and his legion of vampires prepare to rid the world of humanity’s stain, an unlikely trio of heroes dares to stand in their way. When Lisa Tepes, Beloved Wife Of Vlad Tepes Aka Dracula Is Acused Of Witchcraft And Burned At The Stake By An Overzealous Bishop, Dracula Declares War On The People Of Wallachia And Unleashes An Army Of Murderous Demonic Creatures From Hell. Luckily, Trevor Belmont, Last Survivor Of The Belmont Clan, A Disgraced Family Known For Hunting All Kinds Of Monsters, Is Still In Town And Agrees To Take The Fight To The Lord Of Vampires. 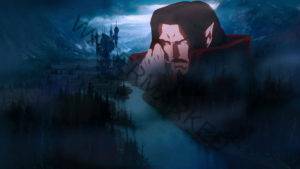 If you like what read about Castlevania Season 2, please remember to share Netflix New Releases on Facebook, Twitter or wherever you guys want it’s all appreciated.